I would sit there, frozen, trying to figure out my bathroom companion’s next move and hoping that they were only there to adjust their pantyhose or something and would be leaving soon. If I was right, I could breathe a sigh of relief as soon as the door closed and get on with my poop. If I was wrong, I could end up sitting in silence awkwardly for quite some time. Worse case scenario: I walk in at the same time as someone else, we have exactly the same plan, and we both end up sitting quietly in our stalls, trying to wait the other out. A Poop Standoff. Sometimes, if a poop standoff dragged on too long, I would flush the toilet, wash my hands, and leave, hoping to try again later. Sometimes times I would make a 180 on the way to the bathroom if I saw a colleague headed in the same direction, and never make it to the toilet at all! I think these stand-offs are the result of a culture that tells women we should be ashamed of our natural bodily functions, that it is unfeminine to make any sort of grunting noises (even while competing in intense professional sports matches), and that none of our parts or excretions are ever allowed to smell like anything other than roses. Women are supposed to be pristine, un-fouled creatures. Now, there is evidence that people of many genders may engage in poop stand-offs. Exhibit A: This frat boy blog post (content warning for general misogyny.) But even here, the author suggests that one method to end a poop stand-off is to simply not poop, but that this solution “only works for girls.” Because girls are mythical bastions of bodily control and repression while boys (who will be boys) absolutely must poop whenever they need to. No. Listen, everybody needs to poop when they need to poop. That’s why most people’s bodies alert them when it’s time to defecate- because it’s necessary. 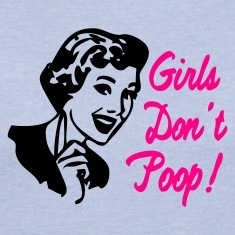 And more importantly, everybody poops. Yes, even Beyonce, despite what writers over at Jezebel and Buzzfeed say. I don’t know when I started stressing over my poop, but I know that I’m done now. Over the past nine months I’ve been following a really simple rule- I poop whenever and wherever I need to. If you could use some more peace with your poop, dear reader, feel free to join me. An otherwise very feminist guy I dated used to insist that women don’t poop. Not very romantic of me, but I made it a point to tell him (loudly and repeatedly) that we do. Women poop. This is kind of like how when you’re in middle school you’re super embarrassed to admit to anyone that you have your period. I used to desperately try not to make any crinkling noises when I unwrapped my pads or tampons. I got over that one in time, because our bodies exist and do things, and that’s ok.
Hahaha, YES Dominique, I WILL join you in ending poop standoffs. I used to do this too, but I’m getting a lot better. I don’t think many women in a public restroom are going to judge you for pooping, so why do we judge ourselves?